Great first presentation, good questions, and interesting group! Informative. Great presentation and solution to a challenging problem. Interesting and useful information. Good presenters scheduled. Doron did a good job describing the pitfalls of trying to achieve scale through other means, such as multi-master replication. 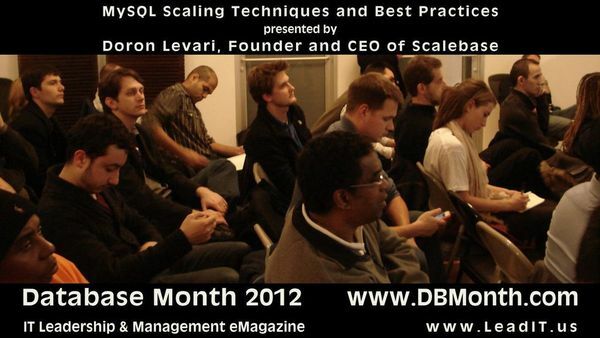 Doron Levari, Founder and CEO of Scalebase, is a long-time veteran of the database industry; Doron has extensive experience in building and scaling-out database systems as well as the organizations and infrastructure necessary to support them. Prior to founding ScaleBase, Doron help build from the ground-floor Aluna, Ltd. which eventually became one of Israel's most successful consulting firms specializing in database design and implementation. Doron led Aluna from its early stages throughout consistent growth, leading towards a successful acquisition by Matrix, Israel's largest system integrator. Doron brings over 15 years of experience and leadership in IT, during this time, he has received multiple international awards and certifications, and is an esteemed lecturer, speaking around the globe. Doron began his career much earlier as a DBA and System Administrator and led complex projects and large scale IT teams for some of Israel's largest organizations, including the training and instruction of database systems for the Israeli Defense Forces. Doron has an MBA degree from Heriot Watt University and a B.Sc. from Bar Ilan University. 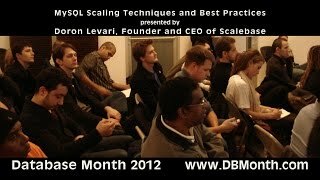 Along with Liran Zelkha, the two have built ScaleBase from early conceptualization to bearing a first to market innovation that stands to change the world of SQL as we know it, while at the same time, preserving the very essence of its own strengths and significance.